VIII Air Force Service Command. The most imposing of buildings and possibly the most covert. Milton Ernest Hall was surrounded in intrigue and rumour. 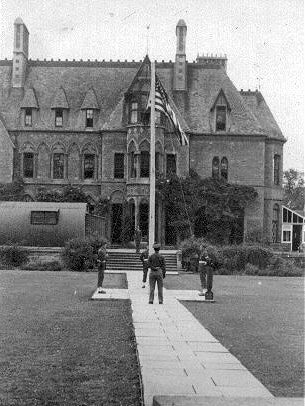 Other than the official recognition as 8th Air Force Service Command HQ it was thought to be central to a wider group of 'stations' concerned with secret allied radio and propoganda transmitting, political warfare, and undercover operations by British and American units. Several governmant ministers were thought to be located there as well as mention of having it's own runway, although it has always been closely associated with Twinwood airfield. Some local rumour has it a tunnel connects the two, although the surrounding landscape would make that highly improbable. 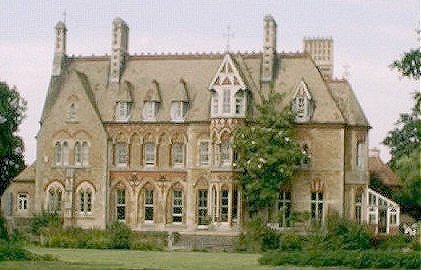 Glenn Miller often stayed at Milton Ernest Hall and along with Don Haynes (manager) based the administration and organisation of the band to the USAAF bases in the UK. 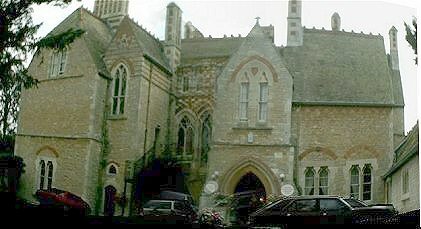 The band were also taken out there for its meals in between broadcasts and rehearsals at the Co-Partner Hall in Bedford. In return for the hospitality shown by General Goodrich and his officers at the hall, Miller agreed to play a concert in the grounds on the afternoon of July 16. 1944. A huge sucess with 1600 officers and men present. "the longest period being when Bing Crosby came on 29 August 1944. Miller lived in the huts in the grounds for about a month and then shifted back into the house." (picture right) Taken at Milton Ernest Hall. 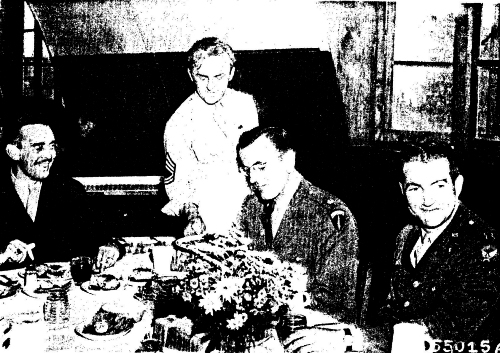 The officer to Glenn Miller's right is Lt. Don Haynes and the other officer is either Capt. Cosgrow or Earlywine. Milton Ernest Hall. August 2000. Although the hut, flag pole and path are now gone the building has barely changed at all. The huge rose bush as seen here at the front of the hall can also be seen on the 1945 photograph (left), then only half the present size.